Hydric Soil Definition: A hydric soil is a soil that formed under conditions of saturation, flooding, or ponding long enough during the growing season to develop anaerobic conditions in the upper part. Hydric soils along with hydrophytic vegetation and wetland hydrology are used to define wetland boundaries. Growing Season Definition: The 1987 USACOE Wetlands Delineation Manual (Technical Report Y-87-1) - glossary, Appendix A defines growing season as the portion of the year when soil temperature (measured at 12 inches below the surface) is above biological zero (5C or 41F). This period "can be approximated by the number of frost-free days." Estimated starting and ending dates for growing season are based on 28F air temperature thresholds at a frequency of 5 years in 10. Click here for the climate tables used for growing season determination (WETS Tables). NOTE: Refer to Regional Supplements for wetland delineation information. Hydric Soils - Criteria (Note: Hydric Soil Criteria is designed to generate a list of hydric soils from the national database of soils interpretation records. Criteria is not intended for field identification of hydric soils, except criteria 1, 3 and 4). The following criteria reflect those soils that are likely to meet the definition of hydric soils. Criteria 1, 3, and 4 serve as both database criteria and as indicators for identification of hydric soils. Criterion 2 serves only to retrieve soils from the database. In addition, the wording of criteria 1 and 2 were changed in 2000 to incorporate recent changes in Soil Taxonomy ( Soil Survey Staff, 1999). Please note that these changes did not cause any soils to be added or deleted from the list. 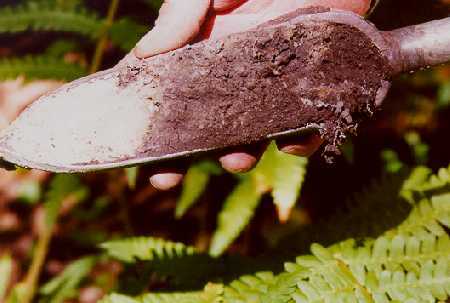 Soils that are frequently flooded for long duration or very long duration during the growing season. 1. Frequently -- at least 5 years in 10, or 50% probability in any one year. 2. Long duration -- a single event lasts 7 to 30 days. 3. Very long duration -- a single event lasts more than 30 days. Flooding: Accumulation of large amounts of runoff on the landscape as a result of rainfall in excess of the soil's ability to drain water from the landscape before extensive inundation and ponding occurs. *water table: the upper surface of ground water where the water is at atmospheric pressure. In the Map Unit Interpretation Record (MUIR) database, entries are made for the zone of saturation at the highest average depth during the wettest season. It is at least six inches thick and persists in the soil for more than a few weeks. In other databases, saturation, as defined in Soil Taxonomy (Soil Survey Staff. 1999), is used to identify conditions that refer to water table in Criteria 2. Visit: NRCS Hydric Soil Page for more information about hydric soils. New England Indicators of Hydric Soils - Download a PDF copy free. WETs Climate Tables (growing season info). IRIS Tube - Indicator of Reduction in Soils (IRIS)tubes visually reflect currenthydric soil conditions caused by recent anaerobic and reducingprocesses. IRIS devices can identify hydric soils in wetlands,investigate depth of saturation in soils, identify failed septicsystems, and qualitatively analyze soil organic carbon content.